When the question of important craft, cooking or work tools arose at Heather's blog, I tried to think of whether I had important tools at work teaching fourth-grade. Bribery aside, one of my favorite work tools is a magnifying glass! When I did my teaching in college, we taught a class of fifth-graders about the American Revolution. 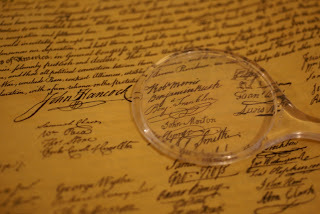 When it came time to discuss the Declaration of Independence, the printouts we had were so tiny that we needed to give the students magnifying glasses out of complete necessity. John Hancock had great foresight! The unexpected result was that the students were toooootally into it. They saw themselves as historical detectives and were devouring the document that might have otherwise been unimportant to them. Drawing teeny tiny drawings, holding the magnifying glass as you draw! So, when in the course of human events it comes time to motivate children to do something you want them to do, magnify it!